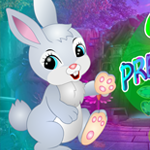 G4K Precious Rabbit Rescue is another point & click escape game developed by Games4King. There were a few houses in a giant village, surrounded by darkness. In a forest, a little precious rabbit lived. One day, the beloved bunny went to look around the forest, but was then unexpectedly stuck in a room. It is your duty to rescue the captured cottontail. It will help you to find the hidden clues in the form of colours and numbers and to locate the items in the environment to save the animal. Find them all and solve all puzzles to free the precious rabbit. Good luck and have fun! Attention, usually the slider clues mean the number of clicks needed. For this game the owls are in position 1 (last scene with jewel door). No clue for the spinning red-yellow puzzle. I put the yellows on top and reds on bottom. PS: Usually means usually in G4K games!